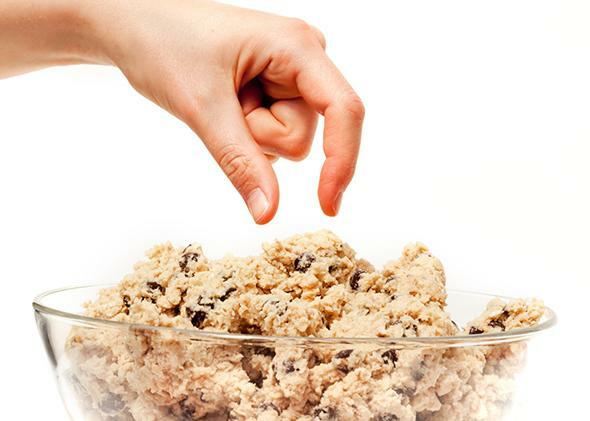 Salmonella and raw eggs: How I’ve eaten tons of cookie dough and never gotten sick. I’ve consumed 360 raw eggs in my life and have never gotten salmonella poisoning. Here’s why. Is cookie dough really dangerous? Not long ago, I made a marble pound cake. Marble pound cake requires making a vanilla batter, adding chocolate to half of it, and then swirling the batters together in a pan. This meant that once my loaf pan was in the oven, I had two bowls and two spoons coated in sweet, egg-y batter. I licked them all clean. Please don’t be alarmed by my lack of manners: I was by myself at the time. But, to be honest, I probably would have licked the bowl even if other people had been around. I always lick the bowl. When I was visiting family for Christmas a couple of months ago, I consumed cookie dough, fruitcake batter, and homemade eggnog. Every time I have made a type of cake or cookie for the recipe column I write for Slate, I’ve unfailingly consumed some of the uncooked mixture. Heck, every time I’ve made a type of cake or cookie just for fun, I’ve unfailingly consumed some of the uncooked mixture. And I have never in my 27 years gotten salmonella poisoning. A quick back-of-the-envelope calculation: I estimate that I’ve baked cookies, cake, or brownies once a month, on average, since I started baking by myself around the age of 12 and that I have tasted the dough or batter every time. Let’s say that each of those batches of cookies, cake, or brownies has contained two eggs—a conservative estimate. This means that I have ingested the innards of—at the very least—360 uncooked eggs in my life. And this isn’t even counting the many times I licked brownie batter from my fingers as a small child, in direct defiance of my elders’ continual warnings: Don’t eat that, you’ll get salmonella. Why have those prophecies turned out to be false? Is salmonella not as common as my parents, aunts, and teachers thought when they drilled caution into my head when I was in elementary school in the 1990s? Have I just been lucky not to encounter any salmonella-infected eggs in my career as a spoon-licker? Or have I been blessed with an exceptionally robust microbiome, rich with “good” bacteria that will overpower malicious invaders immediately, enabling me to eat all the raw eggs in the world without getting sick? It’s probably mostly the first: Salmonella in eggs has always been rare, and it’s gotten even rarer since I was a kid. Salmonella Enteritidis is the subtype of salmonella that’s most commonly responsible for salmonellosis, otherwise known as salmonella poisoning. Unfortunately, SE doesn’t produce any visible symptoms in egg-laying hens, which means that it can pass through henhouses undetected until consumers start complaining of diarrhea and vomiting, which are sometimes so severe that they lead to hospitalization. This is what happened in the mid- to late 1980s, when egg-associated salmonella outbreaks in the northeastern United States killed dozens of people and sickened hundreds of others. Following these outbreaks, egg producers started following protocols to prevent salmonella transmission among their hens. Pennsylvania, in particular, was at the vanguard of the salmonella prevention movement: The Pennsylvania Egg Quality Assurance Program has required participating farms to test incoming pullets (immature hens) for salmonella, prevent hens from coming into contact with other animals (like rats) that might carry SE, and keep eggs refrigerated at all times to prevent any bacteria from reproducing, among other measures. The Pennsylvania program was voluntary but popular, according to Paul Patterson, a Pennsylvania State University professor of poultry science who helped design it. “The poultry industry wanted to get their hands around this thing because they were losing market shares,” says Patterson. “These are good farming families that were feeling that their eggs were no longer safe, and that was just incredible to them.” Pennsylvania succeeded in reducing the portion of SE-infected henhouses from 38 percent statewide to 8 percent. Other state programs were similarly successful, and large egg producers also started taking voluntary steps like vaccinating hens against salmonella; they deemed the extra expense worthwhile if it meant avoiding the PR nightmare of being responsible for people’s deaths. These voluntary programs haven’t eradicated salmonella—indeed, you may recall a bad outbreak that was traced to Iowa henhouses in 2010. But federal restrictions have recently gotten tighter: In 2010 the Food and Drug Administration and the Department of Agriculture began requiring large-scale egg producers to follow safety regulations modeled after the Pennsylvania program, and in 2012 it expanded that requirement to medium-scale egg producers (those that keep between 3,000 and 50,000 hens). But let’s say an infected egg does make it into a consumer’s kitchen. If the egg is kept at or below a temperature of 45 degrees, the salmonella bacteria will have no opportunity to grow. (Most salmonella outbreaks are linked to restaurant settings, where large quantities of eggs are commonly mixed together and kept at unsafe temperatures—practices Patterson calls “egg abuse”—thereby giving bacteria a chance to spread from one egg to another.) If the amount of bacteria in the egg remains relatively small, it’s perfectly conceivable that a spoon-licker like myself would simply miss the infected portion of the egg, which would end up getting killed in the oven or washed down the sink. Finally, even if that bacteria does end up in your mouth and stomach, it might not make you sick. “Salmonella, like a lot of food-borne bacteria, are what we think of as opportunistic organisms, in that they really don’t compete very well with a lot of other bacteria and microbes that are not only in nature, but also are in the human intestinal system,” says David McSwane, a retired public health professor at Indiana University and the co-author of Essentials of Food Safety and Sanitation. In other words, salmonella bacteria fare really well inside a room-temperature egg, where they have all the nutrients they could possibly want to feast on. But they don’t do so well in a healthy human intestinal tract, where they have to compete with thousands of other bacteria for nutrients. If you’re a reasonably healthy adult, like me, you could probably depend on your microbiome to out-compete small quantities of SE and to prevent you from getting sick. Naturally, if you consume a large enough quantity of salmonella, not even your vigorous gut bacteria will save you from illness. And if you’re a child, elderly, pregnant, HIV-positive, or on chemotherapy—or facing some other immune-compromising medical situation—you could get sick from consuming just a small quantity of SE. Everyone’s threshold is different, and unless you want to run a controlled experiment on yourself in which you consume increasing amounts of SE (not recommended), you can’t know how much salmonella it’ll take to make you sick. If you want to eliminate your odds of getting salmonellosis from eggs, you can buy pasteurized eggs. On the down side, pasteurized eggs are more expensive than unpasteurized eggs and don’t produce very fluffy meringues (although in standard cookie recipes, they work fine). On the bright side, if you care about animal welfare, you can now buy certified humane pasteurized eggs. Still, speaking personally, the statistics haven’t scared me off unpasteurized eggs for good. If I continued consuming batter and dough containing about two raw eggs per month, I would likely encounter only one SE-contaminated egg over the course of 833 years. And if I remain generally healthy, I might not even get sick from that SE-contaminated egg. Of course, by the time I’m 860, my immune system will probably be weak enough that I’ll want to avoid unpasteurized eggs. In the meantime, though, I’ll take my chances on that cake batter.